Plant on, men, plant on!! 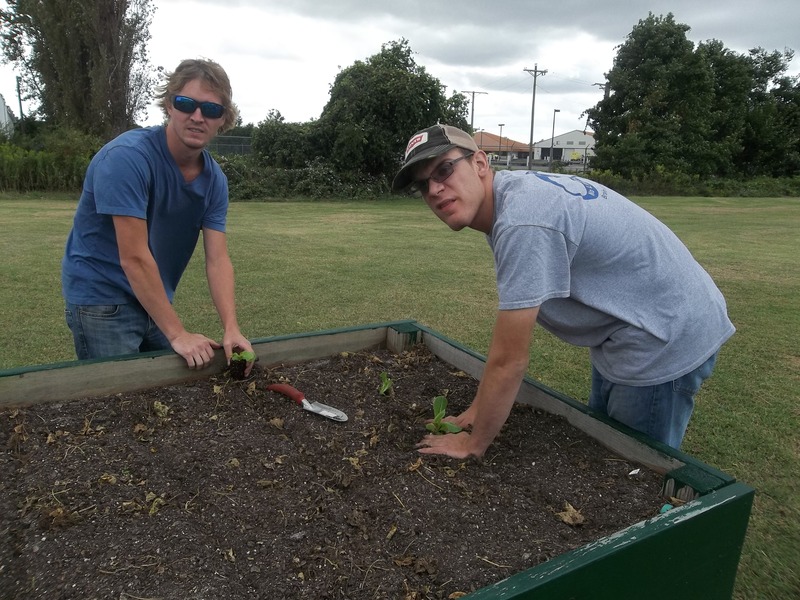 Brandon and Kyle putting in lettuce for our fall garden! A scene from our United Way Exercise Group, with Massage Therapist Betsy Pinder. Amy says, “She’s a good person!”. We are so grateful to the United Way of Virginia’s Eastern Shore for sponsoring this group. Cut, DJ, cut! 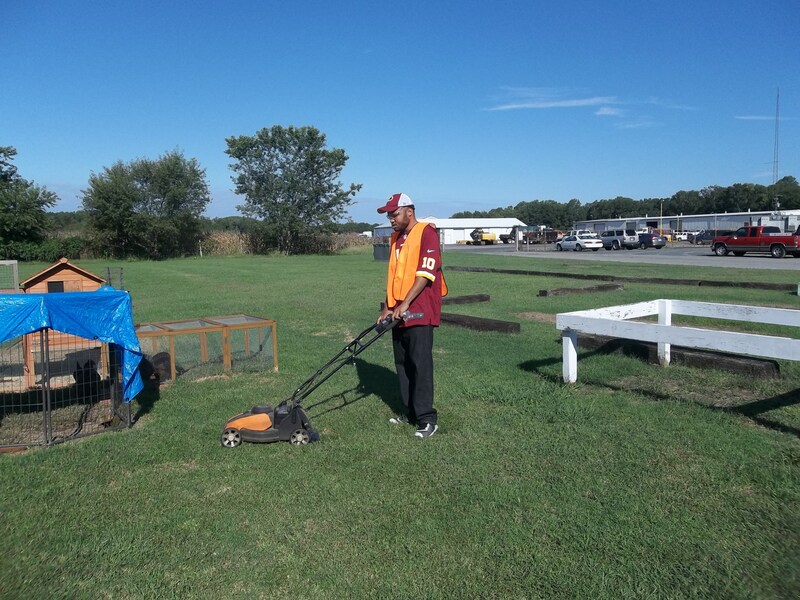 DJ is learning how to use a push mower and doing a great job! 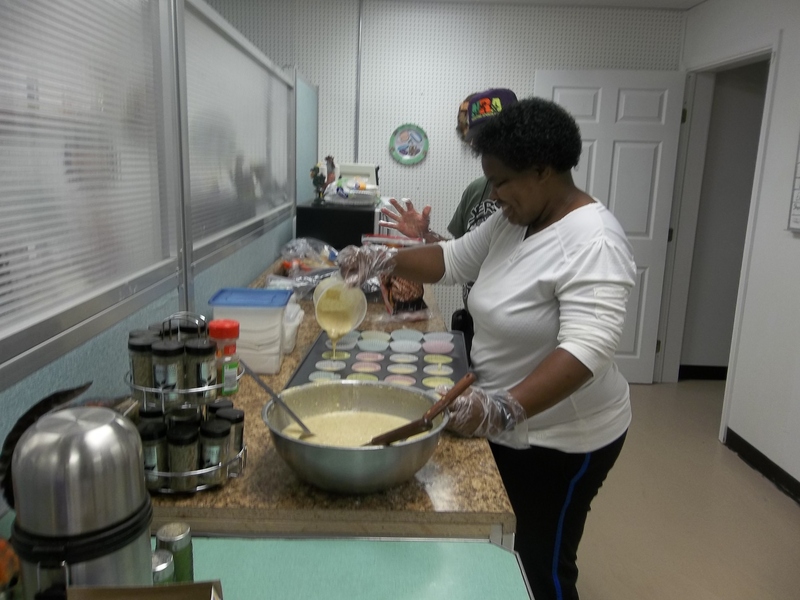 This month our Outreach Cooking team made banana bread muffins for the residents of the GF Horne Assisted Living Community in Onancock. Here is Eva pouring batter! Two nice people putting ribbons on dolls. 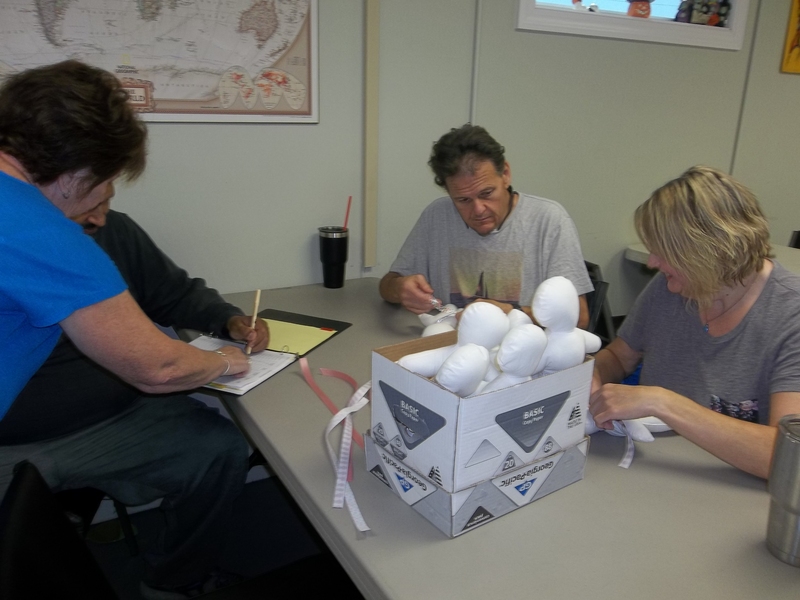 We work with the Kiwanis Club of Accomack County on the Comfort Dolls project. Putting the final touches on the latest batch of Comfort Dolls. These dolls are used with dementia patients and children in our community. Denise helping us to keep score during a cognitive activity. We always appreciate it! 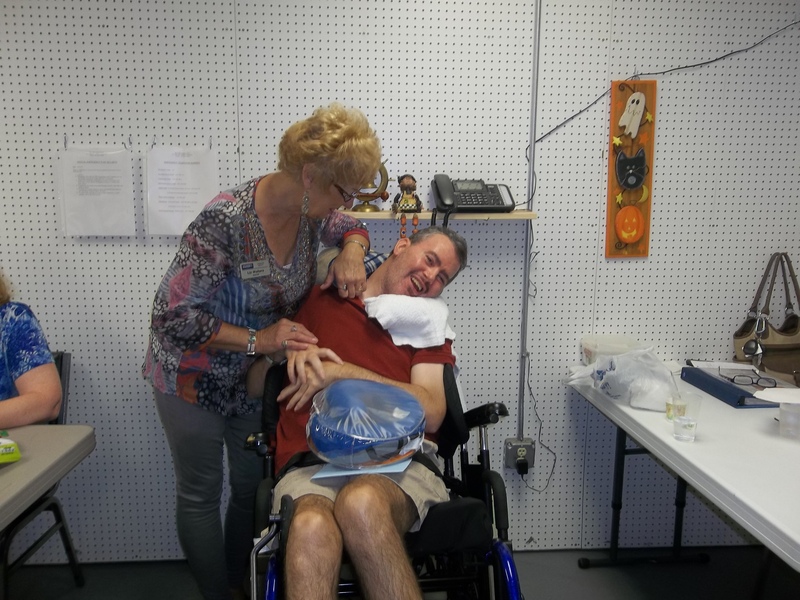 Liz enjoying time with Jason on his birthday – look at that smile!! The gang heading over to volunteer at the Foodbank of Southeastern VA’s outdoor gardens! A big thank you to Rosemary Merritt for donating a bunch of aloe plants! …We found a big bug pupa in the soil! Amy and Emma were not afraid and they say “Hey look we found dinner!” Hahaha just kidding! Sing on please Iesha! You have a great voice! Our 2014 Kate Award Winner always comes to see us and volunteers her time. Thank you for your support! We were looking for the end of the pipe in the ditch because our yard flooded with all of the rain! Doin’ a great job y’all! 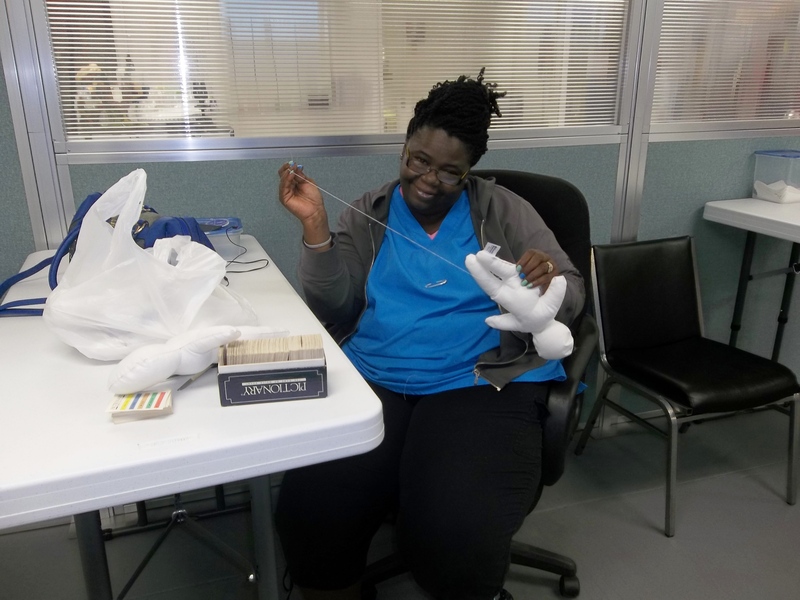 Shirley is working on sewing up some Comfort Dolls while Jason supervises! He must think she is doing a good job because look at that smile! More Foodbank volunteering! It’s hard to see but DJ is harvesting zucchini! A big huge smile (cheesin’) for yummy zucchini! A job well done! Nice harvest for the hungry folks in the community! Brandon is finally getting to plant his palm trees! Dig on! The palms were getting heavy – David was using the wheelbarrow to transport them! Three men hard at work! Making more dog and cat treats for our furry friends at the local shelters! Bye, bye beans and ‘maters! DJ was helping with the last harvest of our summer plants. See ya later ‘maters! Until next spring! Teach on Adrian, teach on! This month our Health Advocacy lesson was on “Fats and Nutrition”! Party day! No Limits celebrated our 4th anniversary as No Limits Eastern Shore this week! Zel and Kyle were helping to get the grill down for the barbecue! We learned that if you forget your grease catcher that you can make one out of 1 aluminum can, 2 paper clips, and 3 rocks! Haha! Nice work Zel and Kyle. Thank you so much John Evans for allowing us to use your awesome grill again! A cognitive lesson before our big party! We had such a great turn out! This isn’t even HALF of our guests; wow! Master Chef David prepping his Sous Chef Emma on how to get the burgers and dogs cooked to perfection! Thanks again for the yummy food! Thank you so much to everyone who joined us to help and make our special day even more special! 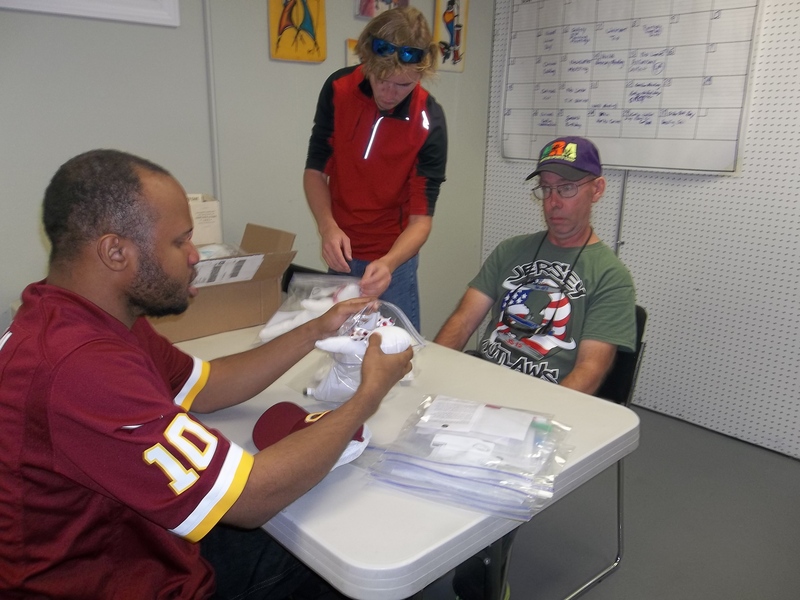 We would also like to thank VA DARS for their continued support and funding our day program! We are so proud to be No Limits Eastern Shore! 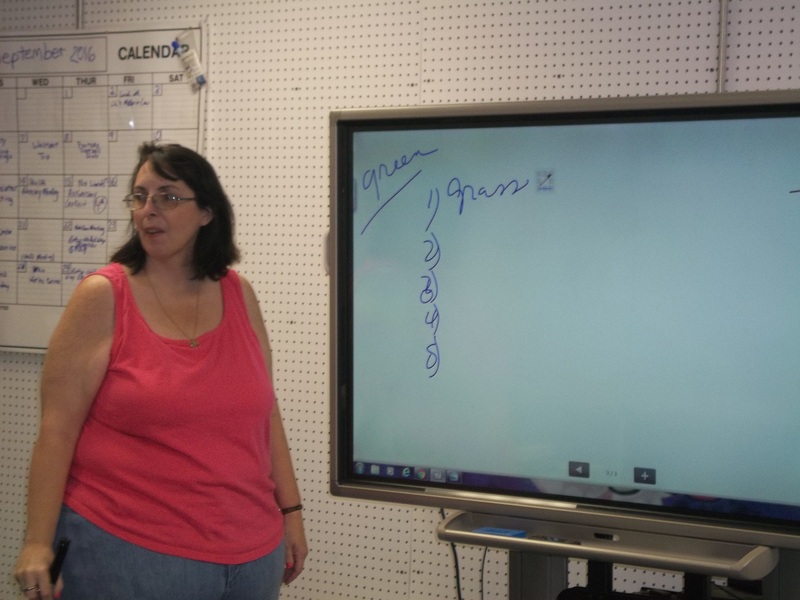 Denise volunteered to be our teacher for a while! We’re sorry this pic is so blurry Denise, but you were an AWESOME teacher! We volunteered at the Foodbank of Southeastern Virginia and the Eastern Shore again this week. We are so happy to help them produce food that will feed the hungry folks of our community! More volunteering! Great work y’all! Tomorrow night the United Way of Virginia’s Eastern Shore will be starting off their next campaign with a “Giving Local & Living United” Dinner & Auction Fundraiser! 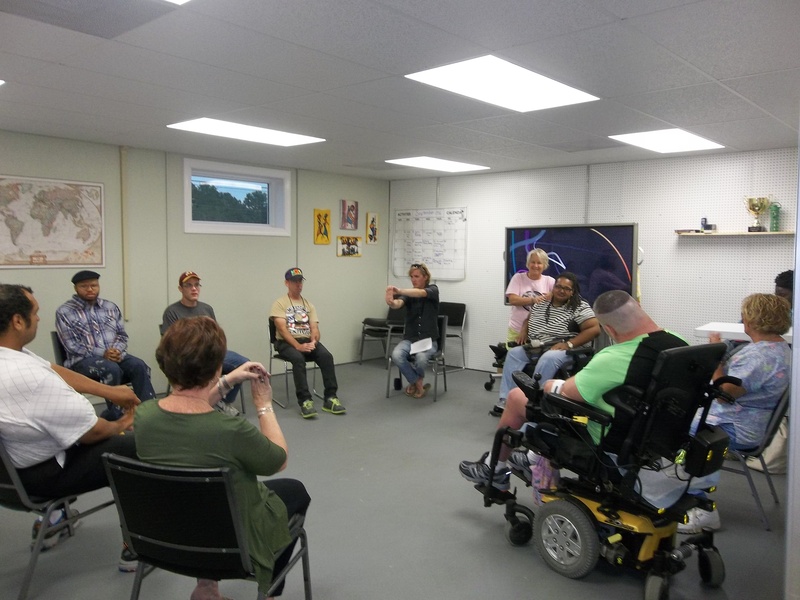 We would like to thank the United Way for their continued support over the past years as they have awarded us grant funds which allow us to operate our in-chair exercise program! This quilt was graciously donated by Carol McGarrity to be auctioned at the United Way event mentioned above with donations made to No Limits! Thank you so much Carol – we all think the quilt is gorgeous! We would also like to thank Donnie and Maryann Brittingham for creating these custom corn-hole boards to be auctioned at the United Way event as well to benefit No Limits! Zel says “WHOA Maryann! Those boards are purrrrty!” haha! Jake is double checking the stats in order to pick the best players for his fantasy football team. No Limits created a league for our participants and staff to enjoy in some healthy competition this football season! So focused! DJ was so happy to get some of his top players on his team! A huge thanks to our Productivity Coordinator, Kyle, for helping ALL of us on Fantasy Draft day! He was a huge help! “Work, work, work, work, work, work – Brandon’s sweeping dirt, dirt, dirt, dirt, dirt, dirt! You’re doin’ a good job Brandon! Amy feeding the chickens a treat! Yum! The Health and Safety team fixin’ the door! Sherry and David working hard on our Comfort Dolls project. This a project that we are working on through a partnership with the Kiwanis Club of Accomack! Welcome back Beth! We’re happy to have your help and we missed you! Beth and Emma stuffin’ the dolls like we’re stuffin’ a turkey! Haha! Good job. Working on our Spearmint Project! We grow spearmint in collaboration with Intrepid Home Health for our local Hospice patients. Growing mint indoors has many therapeutic benefits! Taking out the old and making room for the new! Removing the last of our beans for fall planting! Look at CL go! He’s showing us one of the last of the beans! Brandon doing a good job keeping up with the yard work. Nice job Brandon. Our poor Executive Director, Rachel, was here so early to finalize reports that she saw the sunrise! Thank you Ms. Judy Beasley for the pizza donation! Delicious! Thank you to the Brown family as well for helping to make it happen!